This topic came to a complete surprise to me, I must humbly accept that I knew nothing about it. I am referring to the existence of supervolcanoes. These are enormous deposits of magma that erupt from very large areas every tens or hundreds of thousands of years. I learned that the whole Yellowstone National Park is the largest supervolcano! and it erupts every 600000 years. (Approximately of course). These eruptions have been colossal events on a global scale. They have driven the extinction of species through catastrophic changes in the environment. 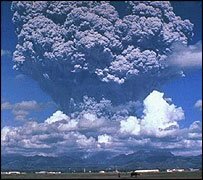 The specific event that I mentioned in the title is the eruption of Toba, the supervolcano that exists close to the island of Sumatra. This has been the only supervolcano eruption in which Homo sapiens has suffered its consequences. According to the evolutionary evidence, we, as species should have a greater genetic variability. This is taking into account that homo sapiens exists for about 200000 years in the planet. However, it has been a mystery, the reason why we are not as variable as predicted by the longevity of our species. Archaelogical and geological evidence has surfaced regarding a massive volcanic eruption in Toba, Sumatra around 74000 years ago. This has been associated with the genetic variability of Homo sapiens which seems to be a 700000-80000 year old species according to this parameter. Following complicated genetic and statistical models, it has been determined that the population of Homo sapiens was reduced to 1000-10000 individuals in eastern Africa. Modern man almost went extinct then. It took more than 40000 years for modern humans to repopulate the affected areas again and start replacing the populations of Homo neanderthalensis and Homo erectus that prevailed in Europe and Asia, respectively. Events of this magnitude have happened before, they do not belong to science fiction. I am not being pessimistic or anything like that, I just want to raise the awareness of how weak we are compared to the forces of nature. I worked for a former astronaut and he said you feel very small looking at the Earth from a distance. Hey Marco, it's been awhile.
" I just want to raise the awareness of how weak we are compared to the forces of nature." There is a story I heard once of a man who believed the universe was an orderly place. He was walking down the street one day and a brick fell off a building. When he regained consciousness he was confronted with the fact that the universe is random. Endless are the possibilities of both destruction and creation. I think every entity in the universe is connected in some way (read the Master Wu Li Dancers and see what physicists say). That would mean that things and forces we can't sense in any way can impact us. Is it really random? Or, is it just impossbile to predict? Welcome. Thanks for commenting. i hope I can have you as a regular in my site. Whoa, you kinda jumped in head first huh? Gotta like your commitment!! Congratulations on all 3. A job is a privilege, a wife is a joy and priviege (ok also a challenge), and a house is a privilege. What color is the nursery - ha ha ha ha ha - there is a 90% chance she's already thinking about it!!! The Discovery Channel did a program on the Caldera, the volcano that sits beneath yellow stone park. It was sobering to say the least. Oh! Congratulations on your marriage! Someone is a very lucky woman! Congrats on the job, spouse, and house (if only there were a synonym for "job" that rhymed). I love the supervolcanos; thanks for the extra tidbits of info. You left out my favorite part: the Yellowstone caldera goes off every 600,000 years or so, and last went off 600,000 years ago. Any day now, Wyoming could go "Fwomp!" and that's it for most of us. In the second paragraph I do mention it, however I did not mention that the last eruption was about 600000 years ago and that we are due for one. Are we witnessing the Sixth Mass Extinction?